This 5k Run\Walk is to benefit the Grand Blanc Athletic Foundation. 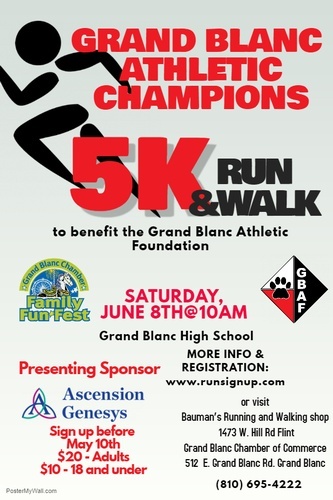 The Grand Blanc Chamber of Commerce in partnership with the Grand Blanc Athletic Foundation(GBAF) have teamed up to provide a 5k fundraising event that follows a scenic route that encompasses the Grand Blanc High school campus. As part of the Grand Blanc Funfest held on the school grounds each year, our goal is to raise money for the GBAF and showcase all of the sports that Grand Blanc High School has to offer. Although this is a running and walking event, the proceeds going to the GBAF are used to fund large scale projects that the school just doesn't get funding for. The Grand Blanc Athletic Foundation, through its fundraising efforts, strives to support preeminent school athletic programs by providing student-athletes equipment and facilities that are safe, competitive, and reflective of their community values. The ultimate goal is to unite our students, families, community, and businesses to "champion" and support our Grand Blanc athletes and athletic programs! RUNNERS: 12 & under,13-15, 16-19, 20-24, 25-29, 30-34, 35-39, 40-44, 45-49, 50-54, 55-59, 60-64, 65-69, 70-74, 75-79, 80 & over. WALKERS: 12 & under,13-15, 16-19, 20-24, 25-29, 30-34, 35-39, 40-44, 45-49, 50-54, 55-59, 60-64, 65-69, 70-74, 75-79, 80 & over. PACKET PICKUP: Available on Friday, June 7th, and Bauman’s Running and Walking Shop 1473 W. Hill Rd Flint. Packets will also be available starting at 8:30 AM on Race day at Grand Blanc High School.